This was today's lunch: the food you see in anime Attack on Titan. But hey, it came in a Survey Corps. brown paper bag. The bag looked, well, dirty. But it was printed that way so it would look so. It was a nice touch. If only I could've eaten it in a walled city as giant people-eaters encroached. As previously mentioned, today I checked out the press preview for Universal Studio Japan's new anime and video game-themed attractions, which will only run until this May. This is the food the park served the press. In Attack on Titan, the characters are only able to get by with basic sustenance due to the Titans' onslaught. The food is never glamorous—bread, potatoes, a small slab of meat and soupy things. So, this official Attack on Titan meal consists of... bread, a potato, a piece of bacon, and bean soup. The characters don't eat this stuff because they love it. They eat it because of post-apocalyptic conditions. See? Just like the anime! Hardly glamorous. Though, at 1,100 yen ($9), these aren't exactly post-apocalyptic prices. Or maybe it is. But hey, it comes in a nifty Survey Corps. paper bag. Let's dive in. Because, I know, I did. The soup was a bean soup with little pieces of meat. I quite liked the soup. It wasn't too salty—because, I'm assuming, there isn't much salt in the world of Attack on Titan. Also, too much salt is bad for you. Don't forget that. Bread! If you are super finicky about stuff like this, there is bread that looks closer to this available to order. The roll, however, tasted good. The top had a wee bit of cream. I don't remember that in the anime, either. Still, I ended up dipping all the bread in the soup. Not at once, mind you. Then, there was the piece of bacon. This isn't American-style bacon. Goodness, I love that. However, the Attack on Titan bacon was tasty. My favorite thing was actually the potato. It had a nice buttery taste that wasn't overpowering and didn't need any seasoning. The flavor was consistent throughout, and I was left wondering how it was cooked. I ended up surprised at how good the Attack on Titan food tasted. Usually, theme park food can be so-so, but this was rather yummy. The one gripe, however, is that the serving size was small. 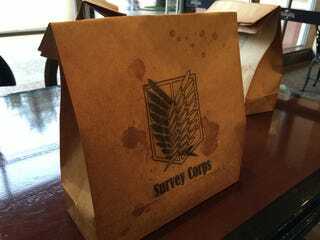 For a Survey Corps. ration, this would suffice. But for someone who'd been walking around an amusement park all day, it doesn't quite cut it. Good thing they served us more Anime food. Like this Neon Genesis Evangelion pizza bun shaped like Sachiel. Which, of course, looks grotesque when you split it open. Yes, those are churro holders. The top part of the churro was covered with a melon soda-flavored icing and, interestingly, Pop Rock-style candy that started fizzing in your mouth. I've never had a churro like that, and if I was 8 years old, I'm sure this would've been the most amazing food I'd ever eaten. If I had to do it again, I might order the Attack on Titan food if the servings were slightly larger (two potatoes, please!). I would like to have the churro, but at 850 yen ($7), it's certainly not cheap. The price, however, does include the Monster Hunter churro holder. So there's that. *I ate (and reviewed) more than just Attack on Titan food. Yes, by now, you know!